Feline leukemia is a high-mortality disease caused by the feline leukemia virus (FeLV). FeLV produces immunosuppression, meaning the body is unable to fight off disease, which can then lead to other disease or infections such as respiratory or gastro-intestinal disease. Cats that survive these initial diseases may later develop some form of cancer, hence the name feline leukemia. The disease is transmitted by direct contact with infected cats or with contaminated food dishes or litter boxes. Feline Leukemia is a serious but preventable disease. 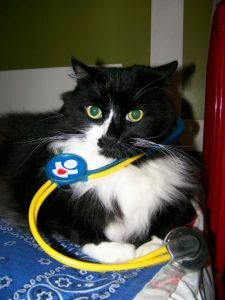 Unfortunately, many FeLV infected cats are not diagnosed until after they have lived with other cats. It is important when adopting any cat to have a Feline Leukemia test done, particularly if they have not been previously tested or if they have not been routinely vaccinated. A small amount of blood is taken and the test is run at the hospital. A FeLV vaccination is available and can be given to kittens at their 10-12 week examination and a follow up booster at 14-16 weeks. It is then important to get the Feline Leukemia vaccination routinely to prevent this serious disease. Rabies is an acute viral infection that can affect all warm-blooded animals – including dogs and cats. The disease is almost always caused by the bite of an infected animal that has rabies virus in its saliva. Younger animals are usually more susceptible to rabies infection. And it’s always fatal once clinical signs appear. What if my dog has possibly been exposed? If your pet has been bitten by or exposed to a wild or potentially rabid animal, talk with your veterinarian right away and report it to local animal control authorities. Even if your pet has a current vaccination, you should still contact your veterinarian. Your pet may need to be quarantined for a period of 10 days after the exposure or immediately re-vaccinated. Once the rabies virus enters the body, it travels along the nerves to the brain. It can take a matter of days, weeks or months for your pet to show signs of the rabies virus. Infected animals often show anxiety, aggression, restlessness and erratic behavior. They also may develop weakness, poor coordination or tremors. Wild rabid animals commonly lose their fear of humans. Species that are normally nocturnal may be seen wandering about during the day. Dogs, cats or ferrets that have never been vaccinated and are exposed to a rabid animal may need to be euthanized or placed in strict isolation for six months. Check with your veterinarian or local public health official for requirements. Your veterinarian is committed to helping you make the best choices for your pet’s health. To give your pet the protection it needs, our hospital complies with the law and vaccinates your pet with rabies vaccine. 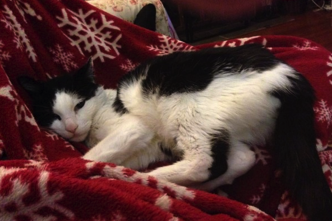 Vaccinations for Your Indoor Cat…Why??? Vaccines provide our pets with the opportunity to live longer, healthier lives. Vaccines allow veterinary professionals to vaccinate against potentially life threatening diseases such as rabies, Feline leukemia, and panleukopenia. A common question that we get asked is “Why do I need to vaccinate my cat if they are indoor only?” There are several reasons to vaccine an indoor pet. Your kitten may start out as an indoor pet, but you may quickly come to the realization that the cat wants to go out all the time. Also, we have had several clients whose cats have accidently gotten out through no fault of the own. Cats that stay indoors can also be exposed to infectious diseases. For example, panleukopenia infection in cats is a potentially fatal and spread through contact with bodily fluids such as urine and feces. Panleukopenia can live in the environment such as bedding, food bowls, toys, litter boxes and other items for a long time. So if a cat owner is exposed to a cat or items in the environment contaminated with infection and fail to change clothes or wash hands they can spread the infection to their indoor cat without even realizing it. Not only do vaccinations protect your pet but you are creating a safer environment for you, your family, friends, community and other pets.